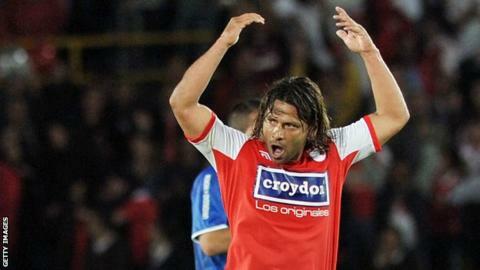 Until he retired last year, Colombia's Gerardo Bedoya was the world's dirtiest player. And he looks set to keep up his bad-boy reputation in his new coaching career. His 46 sendings off in a 17-year playing career earned him the record for the most red cards in football - as well as the nickname "the beast". Bedoya's 41st suspension, which came after elbowing then kicking an opponent in the head, earned the defender an 11-game ban. Even his official website tells you he was "considered one of the most aggressive players in the history of Colombian soccer as well as globally". This week, Bedoya, 40, was appointed assistant boss of Colombian side Independiente Santa Fe on Tuesday - his first senior coaching role. Santa Fe's first game, on Wednesday, brought a 3-2 win against Atletico Junior. Unfortunately Bedoya - who played 49 times for his country - was not there to join in the celebrations at the end of the game. He was sent to the stands after 19 minutes.